Many aspiring teachers feel overwhelmed by the Praxis Special Education test before they even start studying. 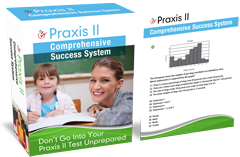 You want to know that your Praxis Special Education practice test accurately represents the exam. But with conflicting reviews all over Amazon, it’s tough to know that for sure. Even with a solid Praxis Special Education study guide, knowing your strengths and weaknesses can be hard when SPED is new to you. If you have a tough time learning from book reading, how can you make reviewing a Praxis study guide worth your time? If you’re dealing with frustrations like these, no worries. These tips will help you choose the Praxis Special Education test prep materials that are best for you and make them fit your learning style. Source: ets.org. Information is accurate as of October 2018. Before you even start looking into Praxis Special Education test study guides, go to the ETS Praxis website to buy one of their practice tests. These exams come straight from the test-makers. So you know that they give you an accurate idea of the format, wording, level of difficulty and content you’ll see on the real test. allow you to judge for yourself how true-to-test a Praxis Special Education book is. free you from relying on biased reviews. let you know that you’re studying the right material. You probably learned all about differentiation and personalized learning for your students. But don’t neglect to apply these principles to your own learning. If you haven’t already picked a Praxis Special Education prep guide, take some time to choose one that fits your own learning needs. Visual & Auditory learners may like guides with video lessons. Tactile learners may benefit from a guide that comes with flashcards. *Note that some of the Praxis Special Education exams have more study guide options than others. In general, Core Knowledge and Applications (5354) tends to have the most because it’s a more common test. Maybe you already bought Praxis Special Education books. Or maybe the one that you want doesn’t come with the things you need. Don’t worry. A little creativity can help you transform your prep guide into a tool that feels personal to you. For auditory learners- record notes on your phone and play them back when you drive or do chores. For kinesthetic learners- use a white board on your wall to take notes as you study. It will encourage you to get up and move every few minutes. For tactile learners- create your own flashcards and flipbooks from the information in your study guide. For visual learners- create PowerPoint or Slides presentations from the information in your guide. People rarely fit into one neat box when it comes to their learning style, so mix and match these tips as it feels right to you! Depending on your state, you may have never even taken a college course in special ed! You probably know your strengths and weakness when it comes to algebra or constructed-response writing. But you may have very little idea of your weaknesses on the Praxis Special Education exams. This where the official Praxis Special Education practice test is key. give you actual data to help find your weaknesses. lay out an objective plan for your studying priorities. Psychologically speaking, we’re much more likely to remember events that were very emotional. Unfortunately, reading from a Praxis Special Education exam study guide isn’t really an emotional experience. But you can associate emotions with the studying process with one trick: read or watch the stories of people with the disabilities you’re learning about. engage the parts of your brain that relate to emotion. match a face or personal experience with each diagnosis. help you recall the information on your study guide. make it less likely that you’ll mix up the symptoms of different disorders. *Disclaimer: If the resources you find, do include factual information about the disorder, don’t trust them blindly. We can’t vouch for any outside resources you use. Always fact check that information with your Praxis Special Education study guides! If you haven’t already registered for your Praxis Special Education Exam, pick your date now. Take into account how much time you’ll need to study. Based on your test date, make a study schedule and stick to it. Be sure to include time for a practice test or two. If you aren’t sure of learning style, take a few learning style quizzes to help you figure it out.